Lu Yu was an orphan adopted by the famed Tang Dynasty Buddhist Zen Master Zhiji of Longgai Monastery. A native of Jingling city which is now Tianmen in Hubei province, he was found one morning at the crack of dawn by Master Zhiji near the lakeside of Xihu or West lake of Jingling at the age of 3. The name Lu Yu was given to him by Master Zhiji after consulting the Yi Jing also known as "the ancient Book of Change". 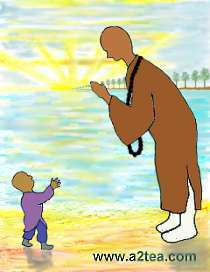 The young Lu Yu received his early education in Jingling Longgai Monastery from Master Zhiji. As a young child Lu Yu showed great interest in tea and acquired and mastered the skill of tea making from Master Zhiji who himself was a zealous tea master. Though Lu Yu received his early training and education in the monastery, Lu Yu's interest was with Confucian studies and Chinese literature rather than in Buddhism. When Lu Yu was still an infant Master Zhiji left him to be baby sat by a Li family who studied and taught Confucianism and Chinese literature. This baby sitter seemed to have etched a long lasting influence on the future of Lu Yu. When Lu Yu was aged 9, Zhiji Chanshi(Zen Master) assigned him the task to copy Buddhist Sutta and engage in Buddhist studies. Although having little understanding on Buddhism nor Confucian studies, the young Lu Yu defied Zhiji Chanshi and confronted him on the teaching of Confucianism on filial piety versus life of a monk. Zhiji Chanshi, furious over this young rebel's disregard for his master and insubordination to the elders, decided to punish Lu Yu for his disobedience. Zhiji Chanshi relegated Lu Yu to a series of laborious chores in the monastery, these included tending to a herd of 120 cattle. However all these did not break or change Lu Yu's determination to seek literary knowledge outside the monastery. By chance while tending to the herd outside the monastery Lu Yu somehow came across a poem styled book titled "Nandu Fu" or "Verses of Southern Capital", written by the famous Han Dynasty(206BC-220AD) astronomer, scientist, mathematician, inventor, artist and literary scholar Zhang Heng(78-139). "Verses of Southern Capital" is a book with detailed descriptions of the Han Dynasty city Nanyang which happened to be Zhang Heng's home town. Lu Yu comprehended little of what was written in the book but that did not stop him from reading it. He practised writing new words he found in the book by scratching it with a stick on the back of his cattle! When Master Zhiji found out that Lu Yu was reading non Buddhist literature and admired Zhang Heng's writing style, he feared that Lu Yu might drift further apart from him and the monastery. Even after much laborious punishment, sweet talks and soft persuasions by Master Zhiji to get Lu Yu to return to Buddhist studies, Lu Yu still resisted to follow Master Zhiji's advice and was persistent in going his own way. Master Zhiji was upset with the attitude of this bull-headed young rebellious orphan boy. He restricted Lu Yu from going anywhere outside the monastery and put him in custody within the Monastery, watched over by some senior monks. Lu Yu unhappy over the whole episode secretly plotted his own plan. One day every monk in the monastery was either busy performing Zen meditation or engaging in other chores in the monastery. Lu Yu, seeing no one was watching over him, quickly seized the opportunity, grabbed his belongings and ran away from the monastery at age 12.